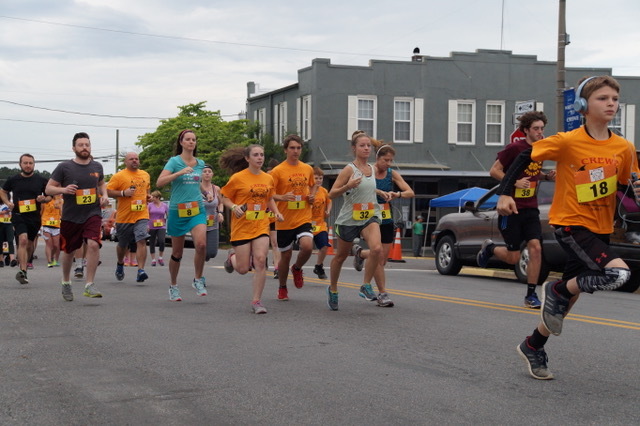 Participants running in the Crewe Homecoming Festival 5K run organized by the local volunteer fire department. In 2012, the Town of Crewe was the first city or town to join the HEAL Cities & Towns Campaign of the Mid-Atlantic! Since then, the Town has made significant strides to incorporate healthy eating and active living as fundamental components to the Town’s environment and culture. Crewe has achieved the Campaign’s Gold Level recognition for its efforts to bring healthier choices to its small, rural community. Crewe is a leading example of how HEAL policies and practices can be integrated using istrategies that facilitate broader participation throughout local government, businesses, community organizations, and residents. The Town partnered with the local Chamber of Commerce to construct a bridge over a gully to improve access to a Town Park. The Town is facilitating further park access by installing a cross walk across the main highway that divides the Town center and the park. The success of the bridge project led to further collaboration between the Chamber of Commerce and a local volleyball league to build a volleyball court for the team and residents. In addition to local infrastructure improvements to promote active lifestyle changes, the Town has passed a Town- wide cigarette tax to discourage smoking. In addition, the Piedmont Community Health Coalition has worked closely with the Town to bring active living programs and activities to residents. The partnership facilitated a community walking competition that brought groups together for some healthy and friendly town competition. “Everyone has really come together to help implement this work” commented Phil Miskovic, a Town Council Member. Councilmember Miskovic describes the broader community support that has been critical for implementing HEAL activities including a Homecoming Festival 5K run organized by the local volunteer fire department and participation from the local library and police department. This interest is sparked by a common community interest. “We approach [HEAL] through an economic perspective” said Councilmember Miskovic. “A healthy community is a place that people want to visit and live and work. Part of the effort is to bring people to live and work and bring people to stay.” Through these efforts, the Town of Crewe is joining forces to implement lasting change that will ultimately lead to a more active and healthy community environment.